1). The company crushed estimates for its fourth quarter: Revenue came in at $1.17 billion, and earnings at $1.85 per share, which were up 25.6% from $928.8 million and 39% from $1.33 per share, respectively, in the same quarter a year ago. 2). The consensus estimate called for earnings of $1.74 per share on $1.15 billion in revenue. So, LULU posted a 6.3% earnings surprise and a slight sales surprise vs. Wall Street’s expectations. 3). For fiscal year 2018, Lululemon Athletica also announced revenue of $3.3 billion and earnings of $3.84 per share. That represents 24% annual revenue growth and 48.3% annual earnings growth. These results also topped analysts’ estimates for earnings of $3.75 per share on $3.27 billion in revenue. Clearly, this was a stunning fourth quarter and fiscal year for LULU. I should also add that Lululemon Athletica provided strong forward-looking guidance. The company expects full-year 2019 earnings per share between $4.48 and $4.55, and revenue between $3.7 billion and $3.74 billion. The new forecast is well above the Street’s current view for earnings of $4.40 per share and in line with revenue estimates of $3.72 billion. After trading as high as 8% after hours, the stock surged 15% today to a brand new 52-week high of $171.43 per share. It’s no surprise that LULU is doing such a fantastic job. In fact, it posted an earnings beat last quarter, too. Earnings of $0.75 per share topped the consensus estimate, which called for $0.70 per share. This represented a 7.1% earnings surprise, and it was also well above the $0.43 per share earned a year ago. As we’ve talked about before, the Fundamental Grade rates a company’s sales growth, earnings growth and the like. So, clearly, Lululemon Athletica, Inc. is a healthy and growing company. However, buying pressure is critical — and that pressure is building for LULU, which was very evident in today’s surge. So, it gets an “A” rating. Looking forward, I expect the company to continue to crush it. This is why it’s my stock pick for the InvestorPlace Best Stocks for 2019. Over the past two decades, Lululemon has led the athleisure fashion movement. The company was founded in 1998 by Chip Wilson, who spent the prior 20 years working in the surf, ski and skatewear industries. Lululemon started as a design studio by day and yoga studio at night in Vancouver, Canada. And that became the company’s first standalone store in 2000. Initially, LULU grew by word of mouth, through brand ambassadors and pop-up shops in yoga studios. Now, the company has more than 400 stores across four continents. And for workout buffs who are too busy to drive to their nearest store, there are multiple Lululemon e-commerce sites and mobile apps. Now, I’m not recommending LULU because it made yoga pants mainstream. Rather, the company continues to expand into mass sports distribution, capturing market share from big-name athletic apparel companies like Nike, Inc. (NKE) and Under Armour, Inc. (UA). It even has a research and development lab that devotes time to examining the human sense of touch. This commitment to comfortable clothes has helped Lululemon expand into the lucrative “comfort and lifestyle” niche. 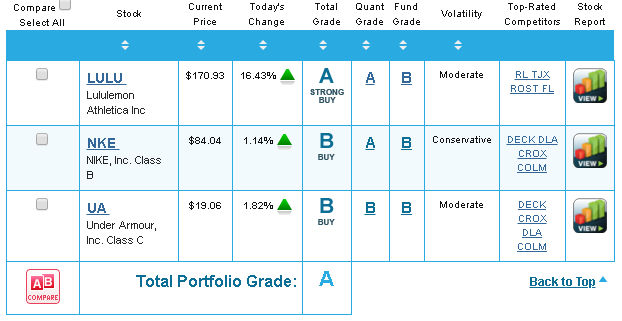 Speaking of Nike and Under Armour, let’s see how they stack up to Lululemon in the Portfolio Grader today. While both competitors get a “B” rating, which makes them good buys, LULU clearly remains the best buy, with its “A” rating from Portfolio Grader that denotes great fundamentals and, especially, strong money flow. I expect LULU to remain the leader on this board as it continues to grow and build out its ecommerce market…especially after unveiling its new subscription service. This gives subscribers a pair of shirts or pants, access to events inside the brick-and-mortar stores and free shipping. I think this is a great idea, since more folks are buying their clothes online. I see plenty of exciting times ahead for this “athleisure” company as it continues to innovate the athletic apparel industry. If you’re looking to add a strong retail stock to your portfolio, LULU is definitely one to consider.